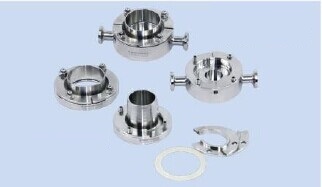 The connector is a connecting device with clamp connector, used for connecting to tank equipment. The product is simple design excellent sterile performance. Quick install various instruments and valves with TC connectors to tank equipment. It's standard ,zero dead angles, and the replacement of the instrument is very simple and convenient. Tank connector: Tank connector is mainly used for eliminating dead angle ,which appears when variety of valves and instruments with TC clamp connector mounted to the tank equipment. Piping connector: Piping connector is mainly used to solve the dead angles which cause by complex piping connectors.